This guide was written by CJ Haughey, author of The Digital Crusader, a blog for slow-travelling introverts and digital nomad wannabes. Often left in the shadow of her popular neighbours, Bolivia has much more than the famous Salt Flats and the terrifying Death Road. 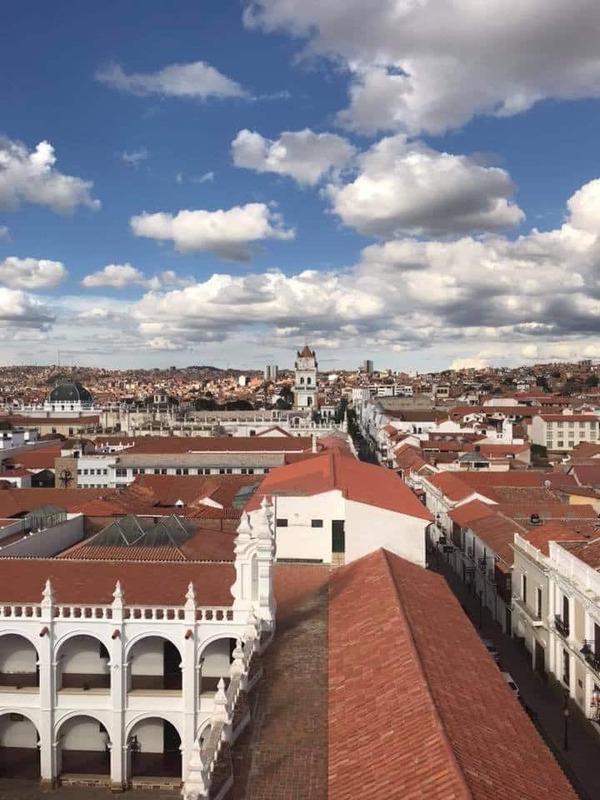 If you visit Sucre, you’re sure to uncover quite a few gems in the most beautiful city in Bolivia. The capital certainly has its charms and many people stay much longer than intended. Are you ready to discover Sucre and to find out about the best things to do in Sucre? 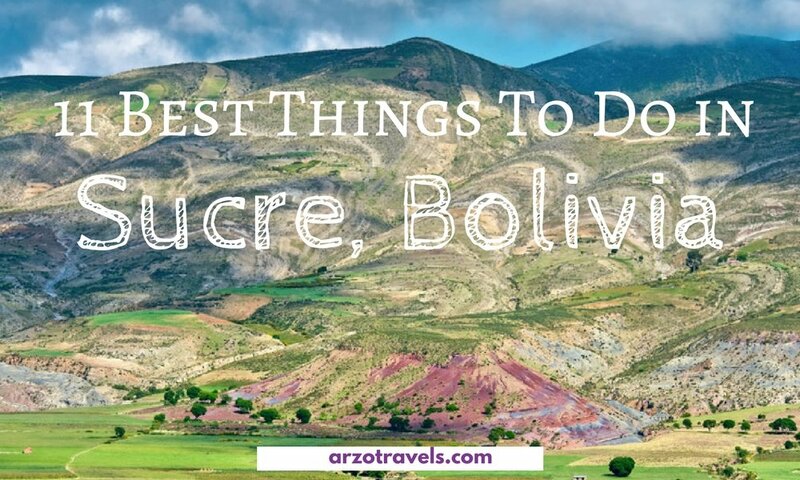 Lest start with the best places to visit in Sucre! Sucre’s colonial architecture has earned it the nickname of ‘The White City’. 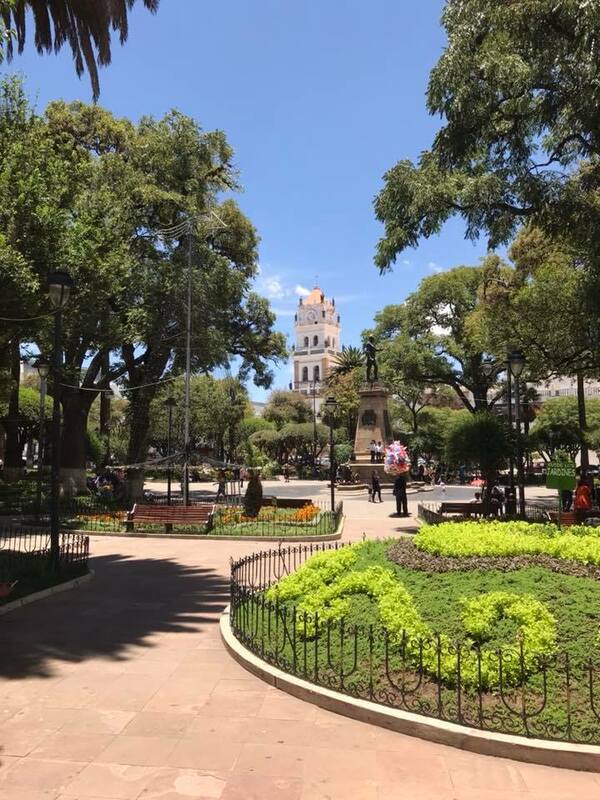 Its ever-vibrant park is the perfect centrepiece, nestled between fantastic buildings such as the Cathedral and Casa de la Libertad. Boasting beautiful shrubbery and a large statue of Antonio José de Sucre, the Plaza is always full of life. While the child beggars can tug on your heartstrings, this is a nice place to chill with a coffee and people-watch, particularly if you arrive in time for one of the sporadic musical performances. Simon Bolivar led Bolivia to independence from Spain in 1825. You can check out a portrait of him in the Casa de Libertad and even see the declaration of independence preserved in a glass case. To really have a good time in Simon’s honour, head north a few blocks from the Plaza and you’ll find the biggest public park in the city. It’s usually busy with young families, amorous couples and cute puppies as well as plenty of decent fast-food options adjacent to the park grounds. The park many benches and open green space for picnics or simply chilling under a tree with a good book. Not a bad way to spend a sunny afternoon! Perched high on the south side of the city is the picturesque area of La Recoleta. The name itself belongs to the 17th century Franciscan monastery that attracts tourists and locals every day. Local kids play football in the plaza and tourists enjoy great views of the city from the arched tunnel or nearby Café Mirador. The sight of the terracotta rooftops at sunset is definitely worth tackling the steep hills. Just a little stroll down the cobbled streets from La Recoleta you’ll see a sign for this museum. 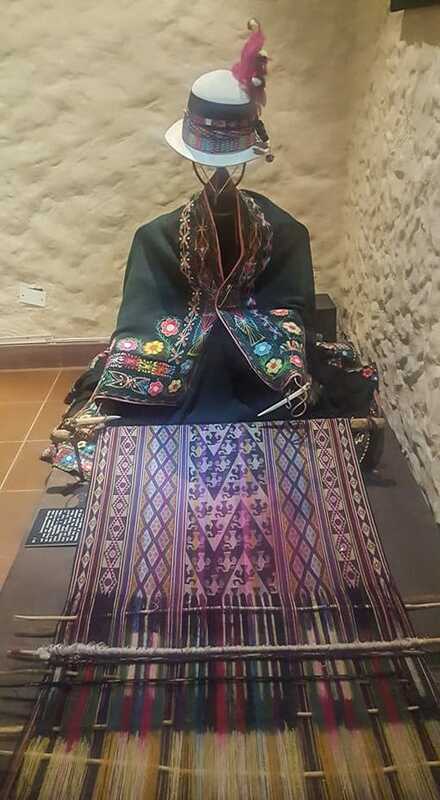 Greeted by a pretty garden full of cacti, visitors can explore the wealth of artefacts, tools, textiles and costumes. This provides a fascinating insight into the indigenous culture and many tribes of Bolivia. There are also some spooky cavemen skulls complete with intact hair braids. Entrance is 22 Bs. It’s another 10 Bs to take photos. 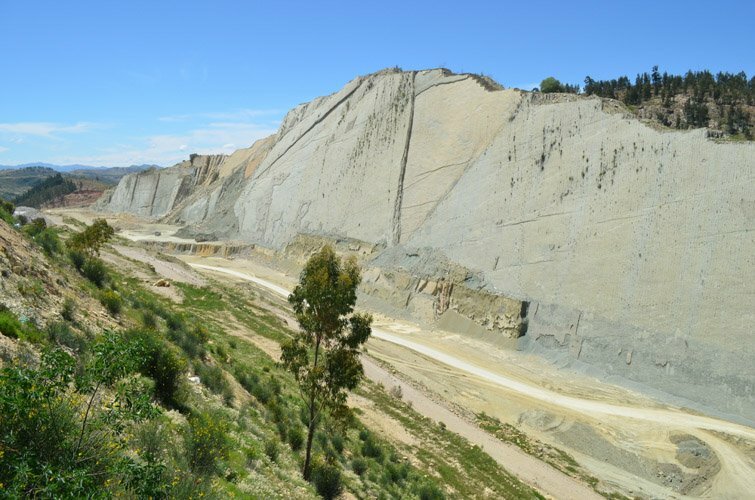 Sucre is home to one of the largest collections of dinosaur footprints ever discovered. Found in 1985 in the grounds of the surrounding cement factory, the prints are set into a cliff-face. You can explore it all in an hour and get pretty close to the prints, but don’t touch them! A taxi from the city centre is 30 Bs. Entrance plus a guided tour costs 30 Bs. It’s another 10 Bs to take photos. 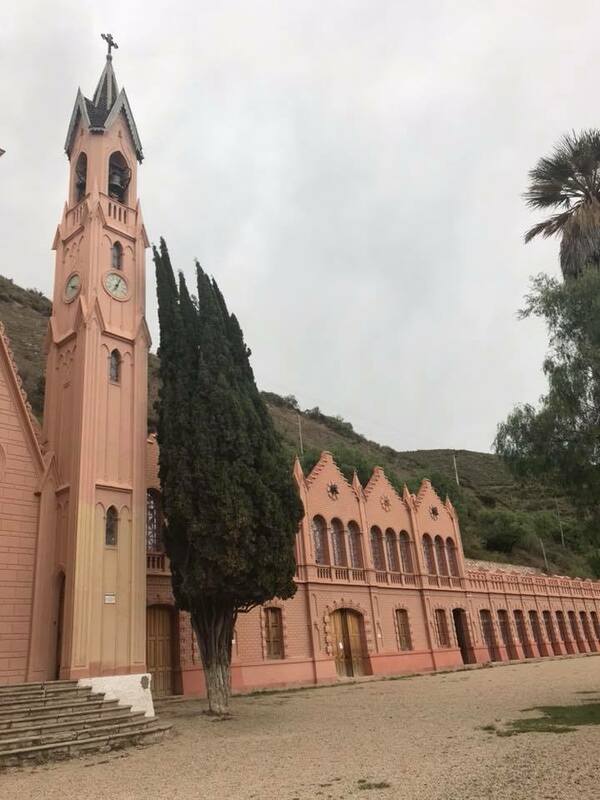 The only prince and princess in the history of Bolivia had no children but they did leave behind a fascinating pink, fairytale castle, El Castillo de la Glorieta. 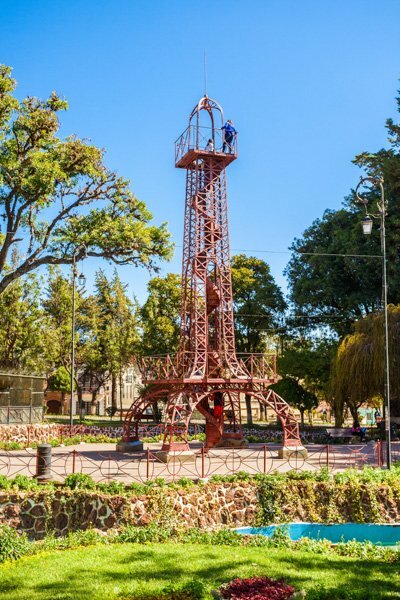 While the building is largely empty, a look around it and up the spiral staircase of the gothic tower is certainly worth doing during your visit to Sucre. A taxi from the city centre is 30 Bs. Entrance costs 20 Bs. It’s another 10 Bs to take photos. This may seem a little grim but I promise you it’s worth a look. 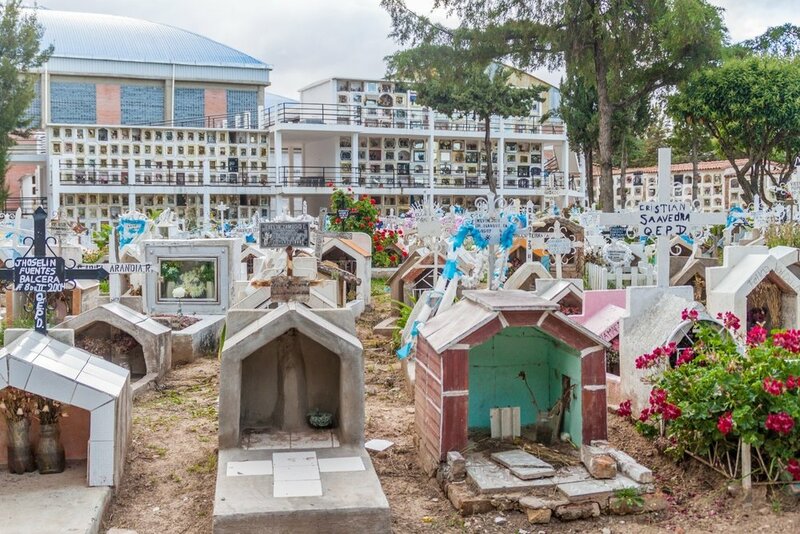 All I can say is that Sucre’s cemetery is by far the prettiest graveyard I have ever visited. Impressive pathways and well-tended gardens blend in with incredible stone tombs and glass shrines. There is a serene calm about the place and it is definitely an interesting walk should you find yourself at the end of Calle Loa, about 7 blocks from the central Plaza. Here are a few great tips on fun things to do in Sucre. Mercado Central has basically most of your grocery needs but if you have a little more time on hand, a trip to Tarabuco is a great way to spend a Sunday. Peruse the many stalls, practice your Spanish with fruit vendors and try the local fare. 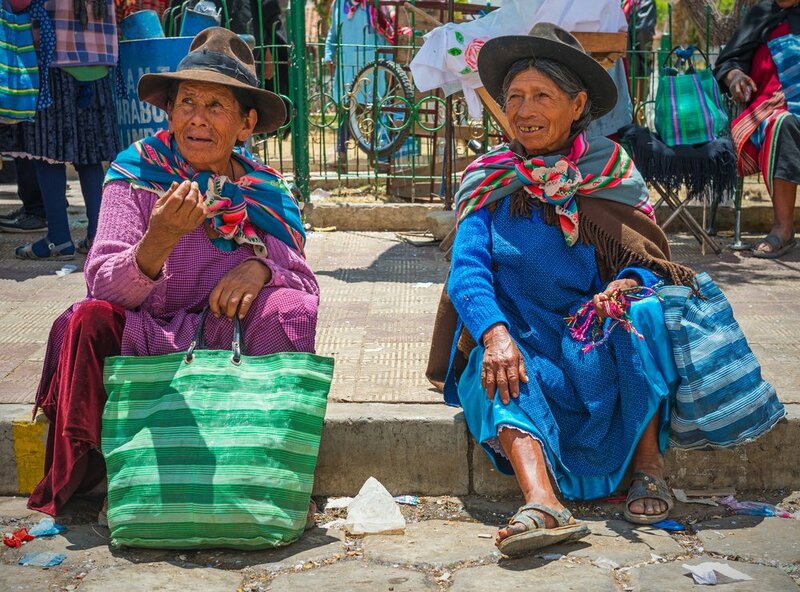 Soak up the Yampara culture and buy some trinkets before catching the bus back to Sucre after lunch. The market is only on Sundays and is best in the morning. Get up early and catch the #14 bus outside Mercado Central. It’ll cost 1.50Bs and take you to the crossroads of Avenida de las Americas and Avenida German Mendoza. You can get a minibus to Tarabuco from here. It’ll take another 10Bs and close to two hours but once you get there you’ll be glad you made it. 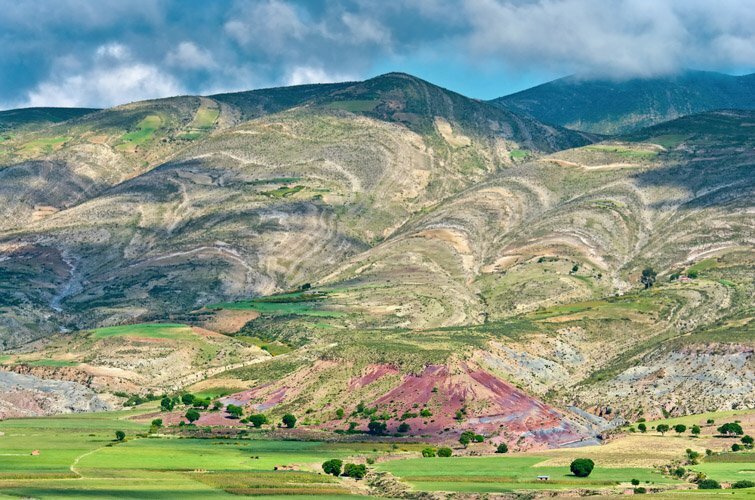 If you seek outdoor adventure then this is the ultimate hiking trip in Sucre. The trek requires a little effort but the views of the mountains and valleys are worth the walk. Visit Condor Café to check out trip options from 1 day to 4 days. Most include visits to ancient cave paintings, dinosaur footprints and home-stays in mountain villages. For a truly cultural experience, don’t miss this! While the food is not mind-blowing, the show itself is a spectacle not to be missed as a team of enthusiastic dancers don fabulous traditional costumes and put on an elaborate performance of folk dances for the better part of two hours. Bolivia is reputed to have the most neutral accent on the continent, plus it is one of the cheapest countries in South America. As a result, you’ll struggle to find a better place to take some Spanish lessons. The city has a bunch of good schools around. Personally, I recommend Sucre Spanish School on Calle Calvo. They offer group lessons as well as one-to-one classes with a focus on total language immersion. The school can also help you find accommodation and offer weekly events including salsa and cooking nights. Address: Calle Calvo, Cost: From 35 Bs per hour. Now, it is about the important aspect of where to stay in Sucre. It’s not hard to find great accommodation for a bargain price in Bolivia. The best places in Sucre are generally close to the city centre, with many just a block or two away from the Plaza. You can’t go wrong with any of these. Located on Calle Loa, this large hostel has a mix of private rooms and dorm options. All rooms are equipped with large lockers and WiFi is decent throughout. There is a nice back garden area and roof patio as well as two kitchens and a cheap laundry service. This is a nice hostel to stay and meet some fellow backpackers. Dorm beds start around 50 Bs per night and a double room with ensuite is about 160 Bs. This tranquil B&B is a short walk from the Plaza. Guests here can enjoy a peaceful stay in comfortable rooms, equipped with WiFi, hot showers and a TV. There’s also a great breakfast and nice courtyard. Single rooms start at 150 Bs per night. 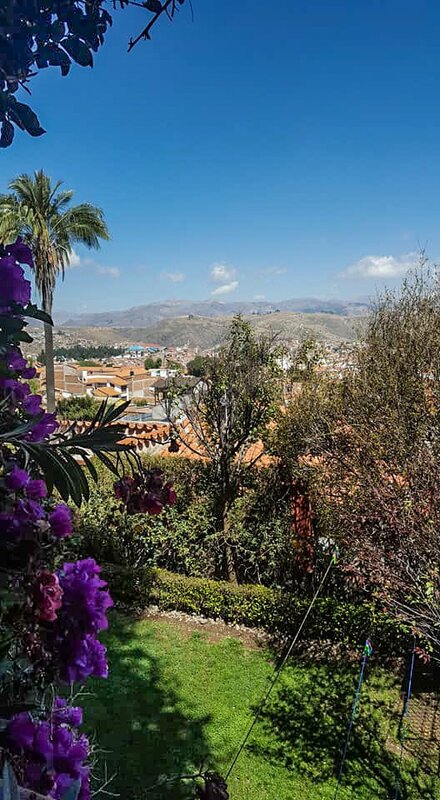 If you’re planning on a longer stay in Sucre, it is great value to get an apartment. We got a fabulous place in a gated community, with large living areas, a beautiful back garden and easily the best view in the entire city. As a digital nomad, I can think of no better place to stay in Sucre. 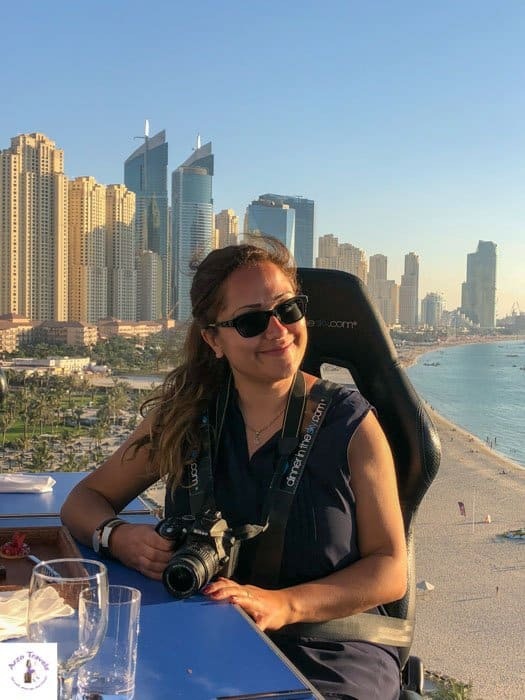 Contact: Marcelo through Airbnb (if you are an Airbnb first-time use you can save money with my link by clicking here). Rent starts about 140 Bs per night, negotiable depending on the length of stay. Billing itself as not just for gringos, Joy Ride is the most popular spot in town for tourists. Great food, good vibe, lively salsa nights make it worth checking out. Opening Hours: Mon-Fri 7am – 2.30am; Sun 7am-12am; closed Sat. This little Venezuelan gem is a personal favourite. The menu offers tasty veggie or meat fillings for either cachpas or arepas, served up fast with a smile and a delicious fruit smoothy. This place is an absolute bargain for lunch or dinner. If you want a wide selection of vegetarian and vegan grub that caters for breakfast and lunch, you’ll be spoilt for choice here! The service can be a little slow but you’ll struggle to find a better purely veggie restaurant in Sucre. If you want real local dining experience, come here. The food menu may be limited but throw in some live music from a Latin jazz band and a few craft beers and you’re guaranteed a good night. Opening Hours: Tue-Sat 7pm-1am; closed Sun, Mon. Florin is one for the football fans. But even if you’re not into soccer, the busy game day atmosphere is a fun place to be while enjoying some of the best Pique a lo Macho in Sucre. Located in the south-central part of Bolivia, Sucre is accessible by a number of major bus routes from around the country. However, as many roads in Bolivia are in a poor state, bus journeys can be long. It’s best to pay a few extra bucks to get a cama or at least semi-cama ticket so you can recline your seat and travel in comfort. Another tip is to buy your ticket a day or two in advance as popular routes often sell out. Sucre bus terminal is on the rural outskirts of the city. A short taxi ride into the city centre will take 15 minutes and cost 10 Bs. If you’re in no rush, the slow train between Potosi and Sucre is a cheap option at 25 Bs. This eight-hour journey departs at 8am, alternating directions each day. The journey to Sucre can be done Tuesday, Thursday and Saturday. While it may be slow, you can enjoy beautiful views of the Chuiquisaca countryside along the way. The El Tejar train station in Sucre is about 10 minutes and 10 Bs away in a taxi. For those coming from afar, it’s possible to fly into Alcantari International, which is about 25km outside of the city. 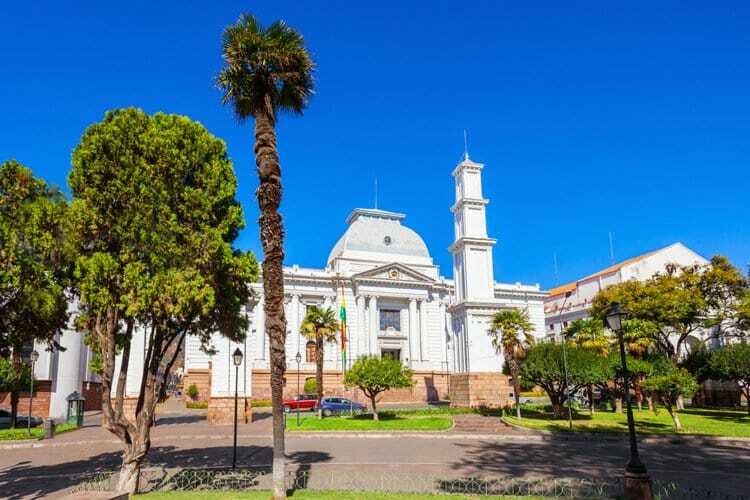 BoA operates direct flights from Madrid, Buenos Aires, Salta and Sau Paulo as well as domestic routes to and from La Paz, Cochabamba and Santa Cruz. A taxi into the city centre will take about 45 minutes and cost around 50 Bs. Sucre may be the capital city but it is relatively small and thus easy to get around on foot. Its grid-like pattern is a throwback to Spanish rule and easy to navigate. If you want to explore the many sites and buildings, just grab yourself a good map and go! I recommend the one from Joy Ride. One drawback is the many steep hills, particularly on the way to La Recoleta. Luckily, taxis are cheap with 10 Bs usually enough to get you anywhere within the city centre and surrounding 4-5 blocks. Sucre enjoys a temperate climate year-round, with cool, dry winters and occasional rainy spells in the summer. Recent years have seen prolonged droughts in the city during November-February, which can make things a little difficult. Some zones even have their water restricted for days at a time and so this is something to keep an eye out for when planning your trip. April and May are great times to visit as the summer heat dies down and the colors of autumn arrive. This is a great time to explore hiking trails such as Las Siete Cascadas or Maragua. Generally speaking, the backpacking rule of thumb is to look at what you’re about to take with you before deciding to bring twice as much cash and half as much possessions. It’s always good to travel light, particularly in hotter weather. An extensive list is not required here but there are some important considerations you should be aware of. Generally speaking, Sucre is a very safe city. Locals here may not speak a lot of English but they are welcome and genuine. That being said, petty theft does occur and so it’s always wise to keep your belongings close and valuables concealed. 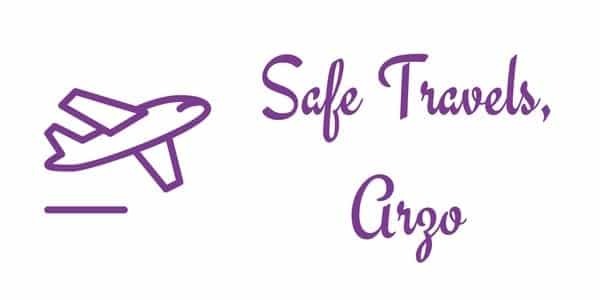 Travelling with hidden purses such as a bra-wallet or only carrying small cash instead of a wallet full of cards is wise, particularly when visiting crowded places like Tarabuco Market. When walking with male friends, women don’t seem to get any trouble. However, my girlfriend received some cat-calls and stares from local men when exploring the city without me. When travelling at night, women should avoid the darker outskirts of the city, especially if they are alone. Taxis are generally trustworthy but should you have any concerns, get a hostel or restaurant staff member to call a reputable service. Sucre has a lot of street dogs, many of which have been through the wars. As a result, some can be a little skittish or defensive so take care if you decide to pet or feed any of them. Are you ready to discover Sucre? 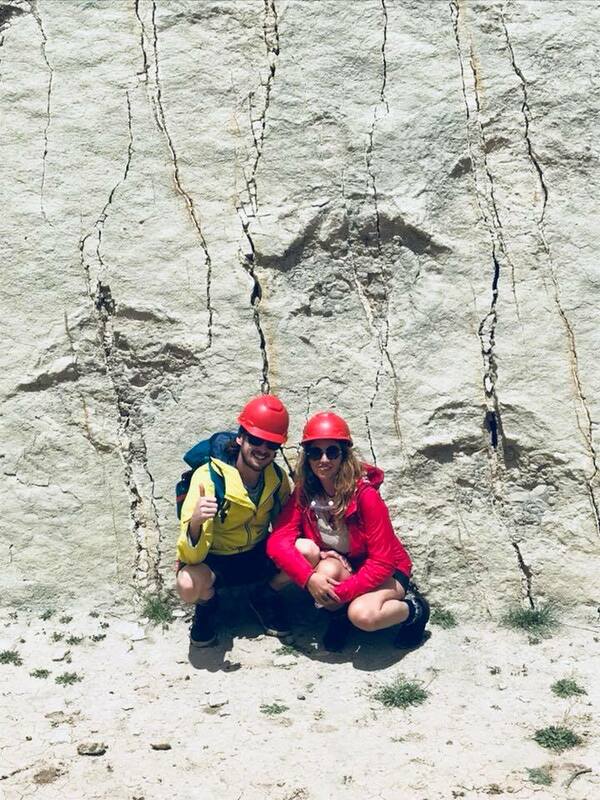 With its great climate and cheap cost of living, Sucre is undoubtedly one of the best places to start your trip of the continent by staying a while to learn Spanish. Its small-town feel and safe atmosphere makes it very easy to get comfortable and stay for a while. With improving WiFi and a range of great little cafés and restaurants, Sucre is a great spot for both backpacker visits and long-term digital nomads to stop by on a trip through South America. CJ Haughey is whispering tips and tales on how to create a digital nomad life on his blog The Digital Crusader. Follow him and The Travelling Tortoise on their adventures around South America on Facebook and Instagram.